A noise survey at a food factory revealed that employees who worked in or near the refrigerated trailer containers could be exposed to levels of noise up to 84dB. 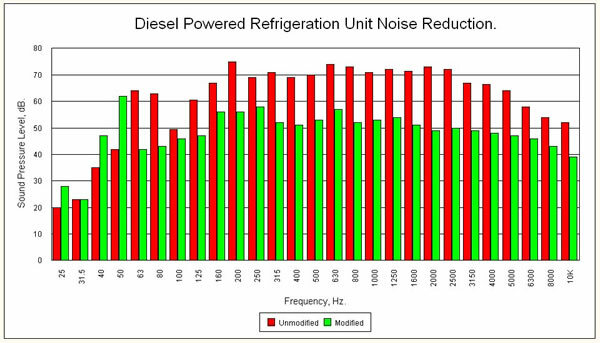 The main source of noise was the diesel powered refrigeration units. An acoustic hood was designed as shown in the photograph. The hood had to allow sufficient air flow for both the diesel units cooling and aspiration. Because the trailers are moved in and out for loading/unloading the acoustic hood had to moveable and was put onto wheels. The noise levels were reduced by 16dB. £2500 per hood (2005 rates).